My Italy trip was fantastic. It’s a really neat country. On one level it’s very different from the United States. Everywhere you go there are lots of old ruins and marble, some of them thousands of years old. I live near the historical city of Philadelphia. We have lots of old stuff that has great significance to our country, but there’s nothing that old. On another level, however, it’s just like the United States. Of course, I’m referring to bass fishing. Fish Italy for a few days and you’ll realize that a bass is a bass regardless of where they live. The first thing I noticed when I arrived, other than the huge number of fish-heads, was that they mostly fish finesse techniques. They’re super experts with light rods, thin line and small baits, and I’m not saying that to be polite. Those anglers can throw finesse baits with any pro I know. But that’s not the way I fished when I was there. You’ll see that in the film. The guys over there wanted to go with power techniques. They wanted instruction on how it all works. I was more than happy to help them. Most of the bass we caught were tricked by a Molix Lover. It’s kind of like a vibration jig, but not really. 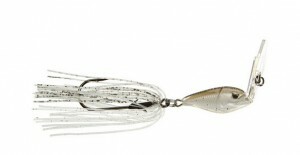 It’s more along the lines of a hybrid jig, crankbait and spinnerbait. The design is the thing. The plastic lip doesn’t angle down. It angles up and it’s fixed. That makes it incredibly weedless even in the thickest wood and even though it has an exposed rear hook. If you watch the video carefully you see that I was fishing it in some pretty thick wood. Heck, we even managed to get one back under some bushes without any problems. I’d say that about 75 percent of the time I used a full-size Devil Spear as a trailer. But here’s the thing: After I cut off about a quarter-inch from the nose I threaded it on the hook with the tail in a vertical position. Basically it looked like the tail of a real baitfish. That’s a trick I’ve been using for some time. Now seems like a good time to share it. I fished my Lover with a spinning rod. It’s a medium action model from Abu Garcia that I helped design. 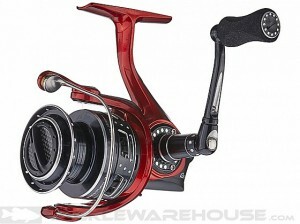 My reel was an Abu Garcia Revo Rocket with a 7.0:1 gear ratio. I spooled it with 17-pound-test Berkley Trilene 100 percent Fluorocarbon line. The guys over in Italy loved what we did. I think we (fish-heads like us) have made friends with some of them for life. Try some of what you see in your own fishing. I’ll bet you’ll be glad you did.